March 7 is a day of utmost significance to the people of Bangladesh. It is only obvious that we will have a special celebration on this day. For the last few years, Joy Bangla concert, organized by Youth Bangla, which is the youth organization of Centre for Research and Information (CRI), has given it an appropriate celebration with rocking performances by some of the biggest bands in the country, Just like every year, the concert was phenomenal with a brilliant lineup consisting of Bay of Bengal, Shunno, Lalon, Arbovirus, Cryptic Fate, Chirkutt, Nemesis and Artcell. There were also various speeches, audio visual representations, vignettes of the March 7 speech and various theme songs played on multiple projectors to make the event even more memorable. Mujib, a graphic novel on the Father of the Nation, was played as well. On top of that, every band who performed had done one or more than one song dedicated solely to Bangladesh and the liberation war. It was the perfect place to be on March 7, the day Father of the Nation Sheikh Mujibur Rahman delivered the historic speech to a gathering of over two million people. 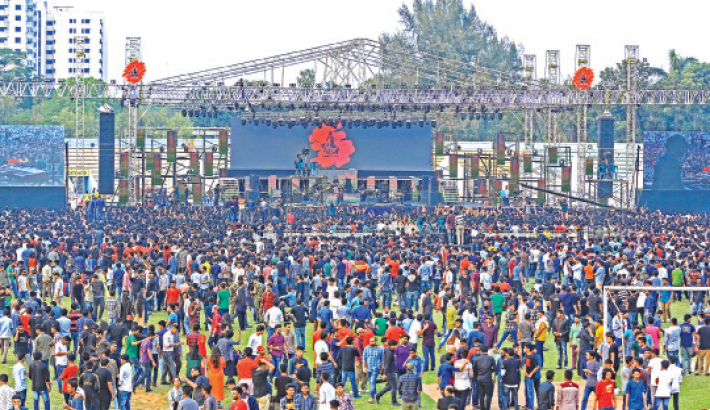 This Joy Bangla Concert held on 7 March at the Army Stadium might have seen possibly one of the biggest crowds a rock and metal gig had ever seen in the country. Considered by mass people as a genre not as renowned as ‘pop’, rock and metal has always been underestimated to a certain extent. However, all such myths were erased with the huge turnover. With thousands and thousands of people filling up every space of the huge stadium, it was a euphoric moment for rockers as well as for every Bangladeshi. Bay of Bengal began the rocking show with a rocking performance. They also did an upbeat rendition of the timeless song ‘Joy Bangla Banglar Joy’. One couldn’t help but sing out loud with them. Next was Shunno. As always they were beautiful and paradoxically powerful. By the time Lalon took the stage, there was hardly any place to stand for fans. It was packed! The folk rock band brought an electrifying power with them. Arbovirus was next to infect all with their outstanding performances. Cryptic Fate, Nemesis, Chirkutt and Artcell - all took the stage one after another. There were many surprise elements this time. Everyone cheered out loud when they saw Nazrul playing dhol with Cryptic Fate! It just addeed to the power and energy. One artist of our favourite band performed with another band such as Shakib from Cryptic Fate perfromed with Nemesis and so on. One of the most anticipated moment was however the appearance of Artcell, or rather the re-appearance of Artcell with original lineup namely George, Cezanne, Shaju as well as the rocking new edition Faisal. Audience went absolutely crazy as they did their timeless tracks. The band also announced their new single ‘Shongsho’. The concert was absolutely mesmerizing. There were thousands and thousands of diversified people of all ages and backgrounds. The crowd saw a great number of female audience besides male. There were some people who had come from other countries such as Germany, USA, etc to watch the show. The security arrangement was absolutely fantastic. One cannot miss out commenting on the amazing sound and visuals. Playing live visuals to accompany the performance of music is not new. But in this concert it was taken to a whole new level. With ample use of high technology such as seen in concerts abroad, Joy Bangla Concert was a spectacular sight. It was a breathtaking synchronization of sound and visual effects with sporadic bursts of flame at the right moments. A blonde was waving her national flag, a guy was being tossed into the air by his comrades and there were big and little mosh pits all across the stadium - all in all, the feelings were amazing.